Glorious and fragile, butterflies flutter through our gardens, pausing here and there lightly, alertly, to sip from a flower, taking off fast if we get too close. Truly they are visitors from another realm, the realm of air and sky, weightless as birds are not, and ephemeral. We find tattered wings on a path, transparent now but still glowing with color, life’s end for a lovely, delicate creature. And many of us remember when there were more. We read about the toll of pesticides, herbicides, vanishing habitats, endangered food plants, on populations of butterflies and many other insects, a toll high enough to explain why an Anise Swallowtail, a Painted Lady, is now a lone, rare visitor to a garden, or a meadow, where once dozens danced in the air. Releasing laboratory-raised butterflies seems as if it could build up native populations, but it can hurt the balance of nature. The newcomers may, probably do, come from a different region, and if they find any local members of the species to breed with, they will weaken the natives for adaptation to local conditions. And the inhumane aftermath of a video moment when clouds of Monarchs are released at a Northwestern wedding is hundreds of butterflies searching fruitlessly for host plants in a region where milkweeds are already hard to find and more are getting buried every day under new parking lots. Release is no help at all. But what happens if native butterflies do venture on their own, one by one, to our gardens, and they find a welcome there? Not only their favorite flowers full of nectar to drink, but exactly the plants they need to lay their eggs on, so that their caterpillars can thrive and grow, metamorphose into chrysalides, and finally, often just a few weeks later, metamorphose again into new butterflies. And they find not only the plants they need, but understanding – gardeners who see them not only as wondrous, inexplicable wanderers, but as living beings, each species with its own complex life cycle and its own needs that must be met if it is to survive. These gardeners nurture their needs, their life cycles, by planting and maintaining their gardens in ways that don’t hurt the butterflies, their eggs, their caterpillars, or their chrysalides. Herbicides and pesticides are absent from these gardens, and gardeners tidy their gardens selectively and with understanding, waiting to trim last year’s mallows until this spring’s Checkered Skippers have emerged from hibernation and flown away, leaving the leaf litter around violets undisturbed for the Fritillaries that overwinter there and come out in spring to chew on new leaves. A gardener notices that some leaves on her hop vine are rolled into nests with caterpillar silk, and instead of running for a spray can or immediately squishing whatever “bug” or “worm” is responsible, she looks closely to see who, what, is there. Shiny black and yellow, spiny…hmmm. She thumbs through her butterfly book and finds in delighted wonder that this is a Red Admiral caterpillar. She didn’t notice when the butterfly came to lay her eggs, and never expected to see this creature in her city garden. She runs to get her kids and share the miracle. So then what happens? We’re not sure. Will clouds of butterflies come to our gardens when we set out the plants that welcome them and when we respect their life cycles? We hope that with time, with patience and with seasons and years, this is exactly what will happen. It’s an experiment, and we invite you to join us in it. Let’s welcome our native butterflies and bring them back to our gardens, woods, and meadows. Because the stages of butterflies’ lives are so different from each other, from caterpillar to chrysalis to adult butterfly, each life stage can specialize in one or two particular activities, an advantage not granted to animals like humans and rabbits that must do everything with the same relatively immutable bodies. Caterpillars move slowly, eat, and grow – that’s what they do. Chrysalides bridge the wide gap from caterpillars to butterflies – their spcialty is staying still and changing. Butterflies fly, sip nectar, and reproduce. After mating, a female butterfly looks for a place to lay her eggs, a task more complex than it may sound. There are only a few, sometimes only one, species of host plant that young caterpillars of each butterfly species can safely eat. If the butterfly lays her eggs on the wrong plant, her young will starve or get poisoned. She must also choose the correct plant part and stage of growth for the caterpillars’ food: for example, a species of caterpillars may eat only young leaves, or only flower buds, of its host plant. The butterfly flutters through her habitat, searching. She lands on various plants and tests them with the hairs on her legs, specialized hairs that can taste. Often she drums against a plant with her forelegs, piercing it with spines on her legs so the plant juices will flow to her taste-hairs. If a plant is satisfactory, she lays her tiny eggs, each about the size of a grain of sand. Different butterfly species lay eggs in various ways: one by one, sometimes just one egg to a plant; in lines, stacks, or broad clusters; in leaf litter near the base of host plants. During their lives, female butterflies lay from fewer than 100 eggs up to 1000, depending on their species and environment. After about a week, young caterpillars chew their way out of the eggs and begin eating. A caterpillar (also called a larva) is superbly well-equipped to do this, with big powerful jaws and an enormous gut, rings of tiny eyes, and six legs and ten prolegs, which have little hooks on the ends. It creeps along the host plant, spinning silk threads out of its body and hooking its prolegs into the silk so it won’t fall off the plant and starve to death. Various caterpillar species eat only the leaves of their host plants, only young leaves, only flower buds, flowers and young seed pods, or a combination of these foods, depending on the caterpillars’ species and dining opportunities. As they eat, they grow, but since their skins do not grow, they keep outgrowing and shedding them, mostly three to six times, until they become full-sized. Each time caterpillars shed their skins, they change a little, becoming hairier, often changing color, and sometimes growing spines and horns, as they mature. Threats to caterpillars’ survival include diseases, parasitic wasps and flies, spiders, ants, ladybugs, and other insects, lizards, toads, mice, and birds. Caterpillar species have distinctive ways of protecting themselves. Some are poison because of the plants they eat, or they resemble other caterpillars that are poisonous. Others resemble inedible objects – bird droppings and dead leaves. They are many different colors and often blend with what is around them. Some caterpillars warn predators away with horns, clubs, spines, tentacles, and spiky hairs, with foul-smelling glands popping out like snake tongues, with bright eyespots on their abdomens that make them look like backwards snakes. Others secrete honeydew that induces ants to care for them and protect them from the parasites that might lay eggs inside them. Some live together in clusters and writhe in eery unison at a predator’s approach, or live in nests made of leaves which they have curled together with their silk. Some hide under leaves, at the base of plants, and inside fruits and seed pods. When a caterpillar is mature, it gets ready to pupate into a chrysalis. It stops eating and excretes everything in its gut. It usually leaves its host plant and walks around for several hours looking for a safe place to pupate, and then attaches itself snugly with silk and with the cremaster, the pointed rear tip of its abdomen. shell that gradually hardens to protect the butterfly developing inside. The colors of chrysalides often blend with what is around them, with grass and plant stems, with bark, earth, and dead leaves. Chrysalides, like caterpillars, sometimes have warning protrusions of horns and spikes. Often they hang upside down. Inside their shells, the outlines of wings, eyes, lengthening antennae and legs, and proboscis are faintly visible, as the caterpillars’ tissues break down and reassemble into butterflies. delicate. Instead of jaws, it has a long hollow proboscis for drinking nectar. After emerging, the butterfly swallows air, which increases its blood pressure. This increase pumps fluid into the veins on its wings, which spread and smooth out. The butterfly excretes wastes leftover from the chrysalis stage, a red, green, or brown fluid called meconium. Hours after the butterfly has emerged from its chrysalis, its wings have hardened and it flutters into the air. Mating begins immediately or almost immediately. Males begin searching for females. They wait (perch) in particular places, such as hill tops and valley floors, sometimes at particular times of day, or fly back and forth (patrol.) While male butterflies are patrolling, they may fly toward anything that passes them, perhaps searching for females of their species. Some males may also be able to smell females inside their chrysalises; they wait to mate with them as they emerge. Butterflies of different species have particular mating behaviors. When a male finds a female of his species, he may zoom in front of her and force her to land. Or the two butterflies may fly together in distinctive patterns before they mate. They may land together as he flutters his wings to waft his pheromones, seductive butterfly scents, in her direction. Scientists believe that male and female butterflies identify partners of their own species partly by color and wing patterns and partly by pheromones. Once a pair of butterflies begins to mate, the process takes from 15 minutes to 8 hours. If the butterflies are startled during mating, they usually fly away, still attached, with one carrying the other. Soon after mating, the female butterfly continues her quest for host plants, and the male resumes his quest for females. During their short lives – from a few days to several months – butterflies live on flower nectar and to some extent on tree sap, dung, carrion, and mud, depending on species. Males of some species congregate at puddles to drink liquids containing salt, which is low in most plants. During mating, this salt is transferred to females to strengthen them for egg-laying. Butterflies sip nectar from many different flowers, and often pollinate the flowers as they are drinking. Important wild nectar plants in the Northwest include spreading dogbane, thistles, native asters, and fleabane; nectar-rich garden flowers include lilac, red valerian, lavender, butterfly bush, zinnia, aster, and many others. Like their eggs, caterpillars, and chrysalides, butterflies are threatened by many parasites and predators. In self-defense, some butterflies are poisonous – if their caterpillars fed on poisonous host plants. Or they may resemble poisonous butterflies. They may have modestly colored wings that blend with dead leaves and tree bark. Dull undersides of wings may also be in contrast to brilliant upper surfaces: the butterflies take off suddenly, startling predators. Some butterflies hide in bark and cracks, especially while they are hibernating. When a butterfly dies, only a few offspring may survive from the hundreds of eggs she laid. But that is enough to replace both parents and keep the species strong. Some butterfly species have only one generation a year, from egg to butterfly, and other species have several. Butterflies with several generations a year are likely to have shorter individual lives. 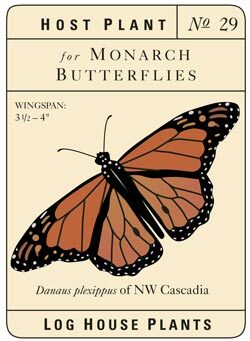 Most Pacific Northwest butterflies live all their lives within this region, although they may move up and down mountains with the seasons, or from the east to the west side of the Cascades. Notable exceptions are Monarch butterflies, which have strong migration patterns, and Painted Ladies, which fly north from Mexico in spring and stay here and die in the autumn cold. Other species of native butterflies hibernate here in the Northwest. Depending on species, they may spend the winter as eggs, caterpillars, chrysalides (most commonly), or butterflies. They hibernate on herbaceous plants, trees, shrubs, rocks, and fenceposts, in leaf litter, wood piles, and grass thatch, inside seed pods, and many other places. Understanding butterflies’ lives helps you know where to look for them. On the Log House label for each butterfly species, you can read about its host plants, favorite nectar plants, when and where males search for females to mate with, which life stage of the butterfly hibernates and in what kinds of places. These details will point you in the right directions for observing butterflies. To identify butterflies easily, use the colorful Pocket Field Guide by Log House Plants or The National Audobon Society’s Field Guide to North American Butterflies which has great color photographs and excellent text. For information about butterflies’ lives and how to approach, watch and enjoy them, we recommend the Handbook for Butterfly Watchers. The author of both bookd is Robert Michael Pyle. When you are observing butterflies, it helps to know that they fly on sunny days with temperatures above 60 F. and are most active above 80 F. On overcast days and during the night, they often roost on tall weeds and in the tops of shrubs and small trees. When it rains, they may shelter under leaves and in clumps of plants. You may also see butterflies gathering at mud puddles to drink. And if you put out mashed, rotting fruit, especially pears, peaches, and bananas, Red Admirals and Mourning Cloaks may come to sip. Even in the cold of winter, if you look carefully, you may spot a hibernating chrysalis. If you are lucky, you might be there in spring on the day the butterfly emerges. Planting butterfly host plants and nectar plants are important ways of extending native butterfly habitat and brightening our gardens with these colorful creatures. The best plantings are those in good-sized groups, not just a plant here and there. If you have room, plant not only one but three or five of each host plant. Or if the host plant naturalizes, encourage it. 1. Don’t use herbicides or pesticides. Many organic remedies as well as chemical remedies are poisonous to not only insect pests but butterflies as well. Ladybugs and praying mantises consider butterfly caterpillars delicious, so introducing large numbers of these predators in your garden may mean a drop in the butterfly population there. 2. Tidy your garden carefully and selectively, even in winter, protecting places where butterflies, chrysalides, caterpillars, and eggs might be taking refuge. 3. If butterfly caterpillars are munching on pieces of the host plants in your garden, try not to worry. (This is a difficult way of thinking for gardeners, but try it.) The caterpillars will eat only parts of your plants, and after all, that’s why you planted them! 4. If you see some weird “worm” creeping along one of your plants, don’t kill it until you have identified it. It may well be a butterfly caterpillar, maybe a rare one that you didn’t expect! To increase the number of butterflies in your garden, you can provide them with butterfly amenities: sheltered sunny garden places with nectar plants and host plants, and woody crevices and leafy debris to hide in. If you have a pond, or even just a bucket of wet soil sunk in the ground, the butterflies will have a small muddy area where they can sip. There are many ways we can work together to make the Pacific Northwest safer and more supportive for our butterflies and other wildlife. We can ask county officials to adopt a policy of mowing roadsides rather than applying herbicides. Ask highway officials to do the same along state and interstate highways. Mowing is less harmful to butterflies and other wildlife (including people!) and also more cost-effective. For the time being, put up “No Spray” sign to protect your land if you live along a country road. We can ask local officials to protect and save green space in and around our communities. Loss of habitat is the foremost reason for decline in butterfly populations. In cities, towns, and in the country, we can talk with our neighbors about landscaping for butterflies and other wildlife in our neighborhoods. We can oppose the use of genetically engineered plants that contain pesticides. For example, one quarter of corn now planted in the U.S. is a variety that contains genes from B.t., Bacillus thuringensis; when pollen from this corn drifts onto leaves that the butterfly caterpillars eat, they die. We are grateful to the bountiful and intriguing information found in the following books and encourage everybody to read them and learn more. Those starred were especially valuable in research for this project. We are especially thankful for Dr. Robert Pyle and his kind, learned guidance. Alden, Peter, Paulson, Dennis, et al. National Audobon Society Field Guide to the Pacific Northwest. Alfred A. Knopf, New York, 1998. Hinchliff, John. The Distribution of the Butterflies of Oregon. Oregon State University, Corvallis, Oregon, 1994. Hinchliff, John. The Distribution of the Butterflies of Washington. Oregon State University, Corvallis, Oregon, 1996. Holland, W.J. The Butterfly Book. Doubleday & Company, Garden City, New York, 1898, 1955. Lewis, Alcinda, Editor. Butterfly Gardens. Brooklyn Botanic Garden, Brooklyn, New York, 1995. * Scott, James A. The Butterflies of North America: a Natural History and Field Guide. Stanford University Press, Stanford, California, 1986. The Xerces Society and the Smithsonian Institution. Butterfly Gardening. Sierra Club Books, San Francisco, 1998. The Xerces Society, 4828 SE Hawthorne Blvd. Portland, OR 97215. $25 annual membership with magazine, Wings.